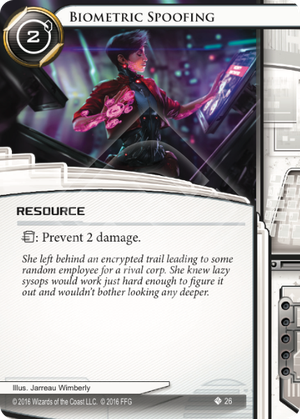 She left behind an encrypted trail leading to some random employee for a rival corp. She knew lazy sysops would work just hard enough to figure it out and wouldn't bother looking any deeper. Can the Runner use Biometric Spoofing to prevent 1 damage? I find it hilarious that a card talking about "lazy sysops" not properly checking their work, has the exact same artwork as a card which mentions making a duplicate of yourself to save doing twice the work. Biometric Spoofing feels like a weaker but more flexible version of Plascrete Carapace. In terms of economy it's not great, 2 for 2 damage prevented. In terms of saving you it's decent-ish. Being able to prevent 2 damage can make the difference between life and death but it could also turn to be completely useless. And unlike Plascrete Carapace Biometric Spoofing is an all-or-nothing proposition. If you take 1 damage and want to prevent it you have to trash it, so if you get damage from multiple sources death-by-a-thousand-papercuts style it won't help all that much. The big benefit of Biometric Spoofing is that it prevents all damage types, including brain damage. Brain damage is notoriously difficult to land on the runner. Being able to avoid some of that really defangs decks that rely on it. Biometric Spoofing works on self-inflicted damage, like Brain Cage.